What a week it’s been with the new cycle that was ushered in with the Wheel of Fortune last week! WOW! We are juggling resources this week. 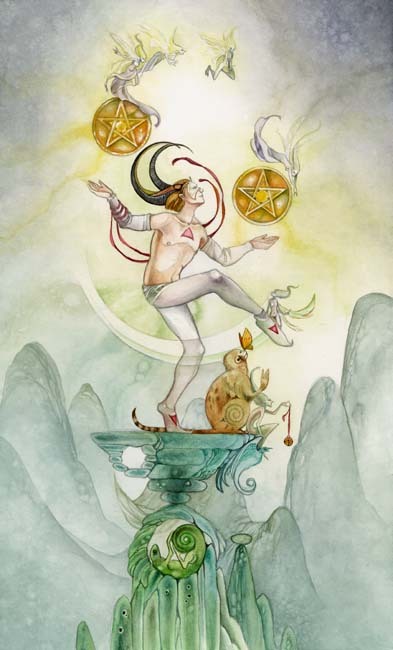 The 2 of Pentacles is about balancing, adapting and weighing things up. How will you play the balancing act? How will you schedule your week so that all the important enagements fit in? How will you plan your project to match your resources? How will you see to the greater good of your family and personal committments? The 2 of Pentacles is a minor arcana. The minor arcana are cards that reflect daily activities that are within our control. 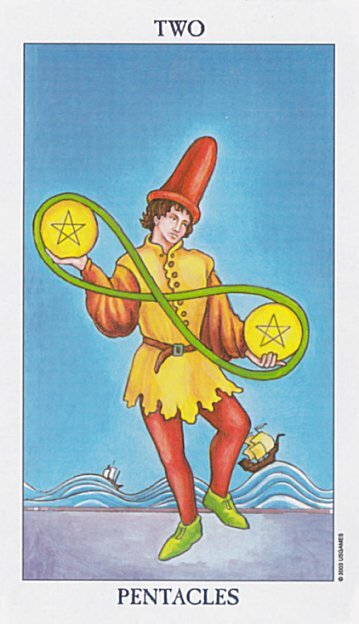 In the latter image of the 2 of Pentacles, which is the more traditional image, the waves reflect the turbulent seas that the ships sail through. So too, the man is able to juggle through life as the challenges demand. It is therefore necessary to take a deep breath in, ground ourselves and make a cup of tea:) Then make a list of all the things that you need to do. By making a list, you may find that some things will fall of the list of priorities, whilst other issues may move up the list. Delegate if you have people to help you, this way you can get more things done faster. But mainly, you are going to have to do more with less and adapt. That is the overall message. Keep calm as you go through this. Getting bent out of shape is only going to rob you of your peace of mind and clarity. Maybe get a trusted confidante to help you cut corners where you have identified opportunities to do so. Or try to get a more streamlined plan together to dovetail with and maximise what already exists.